The battle for access to Iraq’s oil by multinational companies backed up by a US military occupation is just beginning to brew. Foreign oil companies are counting on a new oil law that would replace the former state-run oil company and open Iraq’s oil fields to direct exploitation by foreign companies. Iraq’s powerful oil workers unions and a variety of other groups from Shias to Kurds are against this new law that the Bush administration is hoping to force on the Iraqi people. David Enders and Hiba Dawood talked to several Iraqis to hear their views on this law. A disparate group of political parties threatens to block the passage of Iraq’s new oil law. Opposition stems from issues of regional autonomy, complaints that the law is too favorable to foreign oil companies at the expense of Iraqi workers, and fighting (sometimes literally) over which political parties control oil income. The concern of the ruling Kurdish parties is that they would not be able to strike oil deals independent of the central government and that deals they struck in 2005 would be annulled. Negotiations between Iraqi parties on the most recent draft of the law were facilitated hurriedly by then-US ambassador Zalmay Khalilzad in March. At the time, it appeared a deal had been brokered between the Kurdish parties and the Shiite bloc. The draft allowed all 18 of Iraq’s provinces to sign their own oil deals with foreign firms, which some analysts and politicians say will lead to further de-facto partitioning of the country. “There is no doubt that the American side is totally satisfied with the oil law, but it is harming to the Iraqi people and to Iraq,” said Ayad Jamal al-Deen, a moderate and outspoken cleric who championed the US invasion and is now a member of parliament on Ayad Allawi’s Iraqia list, a grouping that describes itself as secular and nationalist. Allawi himself was appointed as prime minister after the “handover” of power to an Iraqi government in 2004. Al-Deen continues: “The law was written by Iraqis yet it completely pours to the American companies interest. In addition to that, if you read the draft well, you will see that it leads to the division of Iraq.” However, Shiite bloc politicians made statements in May. The Sadrists and the Fadhila Party, which make up the rest of the bloc, are opposed. One reading is that they see it as too favorable to the Supreme Council for Islamic Revolution in Iraq (SCIRI). In any case, there is an ongoing fight between the three parties for influence and control in the south, including oil fields around Basra, the country’s terminal in the Arab/Persian gulf. Further, Fadhila is aligned with the Southern Oil Worker’s Union, which has staged work stoppages in the past, though none of the stoppages have been extended. Prior to the vote, two of the law’s three main authors said they no longer felt the law would work. It would end the state monopoly that has existed since the 1970s and US advisors have aided in writing it. “Oil has been in the hands of the central government since the first time it was extracted, and not in the hands of the regions or provinces,” al-Deen said. “It will weaken the central government. And if it becomes weak, then Iraq is split.” Oil law The new law sets up a federal commission in place of the former state-run oil company and would open 65 of Iraq’s known 80 oil fields to direct exploitation by foreign companies. Hassan Jumaa is the head of the Southern Oil Workers Union and says that the law is not specific enough with regards to how foreign companies should operate and he fears Iraqis would lose potential revenue. Complaints that foreign companies charged with reconstruction were using foreign labor prompted a strike in 2003. “We have been in touch with the members of the parliament on this issue and they agree with us that this law doesn’t meet with the Iraqi people’s ambitions,” Jumaa said. “I have warned against foreign companies investing in our oil without setting up legal regulations. We do not want all the foreign companies to take Iraqis’ resources.” Hassan al-Shumary, one of Fadhila’s MPs, rejected the law as something that should be discussed in the future. Many Iraqis also reject the constitution, ratified in 2005 and virtually unchanged, despite efforts and promises by various parties to amend it. “This is not a good time to vote or even just discuss the oil law; there are articles in the constitution related to the Iraqi natural wealth that need to be amended before we think about the oil law. This is wrong,” al-Shumary said. “We must wait till we amend the constitution.” The agreement on the draft law came after negotiations between the country’s ruling parties postponed the announcement of the law twice in the past year. Mahmoud Othman, an (also outspoken) independent Kurdish politician who is nonetheless close to rulers of Iraq’s northern governorates, said that the biggest sticking point was whether the Kurds would be allowed to pursue oil contracting in the north independent of the central government. A Swedish company has already been granted exploratory rights by Massoud Barzani, the president of the Kurdish autonomous area. Othman said that at a meeting 10 days before the announcement that the cabinet had passed the law in March, Khalilzad met with Kurdish leaders and pressed upon them the importance of passing the law quickly. “It shouldn’t have been finished behind closed doors like this,” Othman said. “Many people in Iraq, especially some oil experts, they think America has intervened too much in the issue. They shouldn’t have been involved in the negotiations. It was brokered by the Americans.” The Associated Press reported that shortly after the first discussion of the law in the Iraqi parliament, advisors to prime minister Nouri al-Maliki said US officials gave al-Maliki the impression he would be removed as prime minister if a law was not passed by June. “Security issues” Political pressure led to bypassing people with critical knowledge of Iraq’s oil sector, said Kareem al-Shamma, analyst and journalist with more than 40 years of experience working with the state-owned oil company before the war and as a consultant all over the Middle East. “To our knowledge, even the senior people in the ministry had no hand” in writing the draft, al-Shamma said. In February, al-Shamma and about 60 colleagues held a conference in Jordan and made recommendations regarding the law. They obtained a draft from a member of parliament with Allawi’s party—none had been made public. Al-Shamma said he and other colleagues with working knowledge of past oil operations were consulted initially by former oil minister Bahr al-Aloum two years ago, but have since been left out in the cold. Instead of urging parliament to vote against the law, they circulated a letter last month asking MPs to fix what they saw as loopholes, mostly in dealing with foreign companies. He said that regional deals for exploration of oil in Kurdistan that the Kurdish regional government made with Norwegian, Turkish and Australian firms are an example of the lack of transparency the law allows. “We know the Kurdish side is getting 20 percent of this,” he said. “But we don’t know who that is going to.” Al-Shamma said that the current Kurdish project was administered by people with little knowledge of the oil sector who would be forced to rely on the recommendations of the companies they had brought in. Al-Shamma also questioned how foreign oil companies would operate without a substantial reduction in violence. The country’s northern oil pipeline has been rendered inoperable due to the large number of attacks against it. Attacks have been rare in the south, which accounts for all of the country’s current production, but one occurred in April. Al-Shamma predicted security issues would lead to contracts being picked up by small “gamblers” rather than large oil companies capable of providing the massive reconstruction needed to revive an industry that has been neglected and subjected to war and sanctions since the 1980s. Essentially, much of its equipment is old and failing, a problem seen in technology across various sectors. The drilling methods used are considered by some engineers to be archaic and harmful to the longevity of fields. Othman also predicted the new law would ratchet up already entrenched violence. 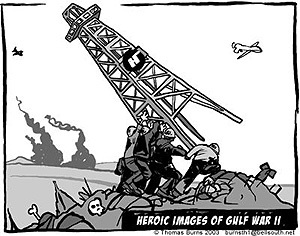 Iraqi guerillas attack pipelines and oil production facilities regularly, as well as ministry of oil employees. “All the people who have been making violence are against this new law,” Othman said. “Because of this new law they may escalate their attacks on oil fields; this is a possibility, yes.” Despite assurances to the contrary, Sunni Arabs, who have little representation in the government, fear they will not receive their share of the country’s wealth. “This is one of the latest shows of conspiracies on Iraq; crumble and divide its wealth, and steal it by the foreign companies,” said Saleh Mutlaq, the leader of the Iraqi National Dialogue Council, a secular party accused of links to the former government. “It is set up to strengthen sectarianism and ethnicity in the country. Even the natural resources started to be divided on a sectarian and ethnic basis! This will form a disaster to the Iraqis. Add to that, this wealth won’t be used the optimal use. The management will be decentralized by the regional governments, and they will be given more authorities than the central government. This law is a serious one. We as the National Front Dialogue will refuse to vote for it.” But it was unlikely Mutlaq would be in Baghdad to vote against the law. Since the assassination of his brother last year, he spends most of his time in Dubai and Amman. Many members of parliament also regularly fail to attend; a quorum is rare. He also warned of increased violence. “I think there will be no comfort and no security for the companies that are going to invest in the oil sector in Iraq,” Mutlaq said. “Probably what they are going to spend on the security will be so expensive on both the companies and Iraq. It is not that important to pass the law, it is more important to implement it.” NOTE: At press time, the draft proposal was within a few weeks of being voted upon, though the vote had already been postponed more than once. About the Authors David Enders is a freelance journalist and author of Baghdad Bulletin (Michigan) and Hiba Dawood is an Iraqi journalist based in the US.